Bluesound Generation 2i review | What Hi-Fi? 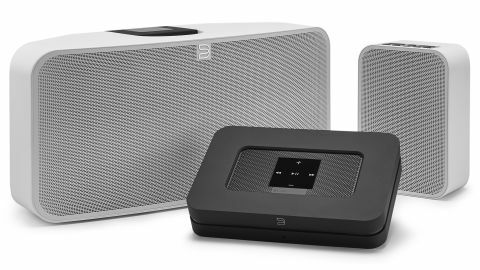 It’s been a while since we were last treated to new products from Bluesound – although as the recipient of three consecutive Product of the Year Awards, the company has probably learnt the value of not tampering with its own success. Since this time last year, however, Bluesound has lost a bit of ground. The introduction of cheaper, but more sonically talented products to the market (Audio Pro's system, for example), caused us to revisit our review. Ultimately the Bluesound second generation lost a star. The star rating might read the same for this suite of Bluesound 2i products, but that doesn’t tell the whole story. Some products have been tweaked and others changed entirely. As a result, some have suffered, some improved, and some become class leaders - and a complete Bluesound system could very much still be the best multi-room choice for you. In this review, we focus on the same components we have for all multi-room tests for a little while now – the cheapest and most expensive wireless speakers, and the linking device to incorporate your existing hi-fi system. With the Pulse 2i, Bluesound has effectively decided to tear up the blueprint and start again. The Pulse 2, already the latest of the range’s speakers granted a second-generation makeover, was the sole component to retain its five-star status when we pitted the Award-winning multi-room system against renewed competition earlier in the year. Elsewhere in the range, comparatively minor tweaks to those products that lost ground – the Node 2 streamer in particular – have brought varied, but considerable gains. A more cautious approach to updating the Pulse 2 may have shed different light on this latest incarnation, as well as perhaps avoiding another price increase – the Pulse 2i now costs a hefty £749. But Bluesound’s ambition in creating the Pulse 2i is admirable. Though outwardly it pretty much mirrors its predecessor, beneath the surface it is a different being altogether. The previous driver configuration of two 7cm drivers and a single 13cm bass unit has been swapped for a pair of 25mm tweeters and two 13cm bass drivers. At the other end of the scale, the Pulse Flex 2i has undergone tweaks rather than a full makeover. Its predecessor, the Pulse Flex, lost its five-star status due to a price increase and the emergence of stronger new competitors. Bluesound’s focus here has been on upgrading connectivity, with otherwise comparatively minimal tweaks to performance, to maintain its original character – and its £299 price tag. The only technology not trickling this far down the line is two-way Bluetooth, but it does take on Alexa Voice Control and Apple AirPlay 2 capabilities. Beneath the lid, the Pulse Flex 2i resembles its predecessor, with a 25mm tweeter and 9cm woofer driven by an impressive 25W of bi-amplified power. The Pulse Flex 2i can be portable too, thanks to an optional battery pack (£69) that attaches to its back panel. Bluesound also offers wall brackets, which help incorporate a number of these speakers into a home cinema set-up, alongside the Pulse Soundbar 2i and Pulse Sub 2i. But the product that Bluesound has altered least on paper is the one that has seen the greatest upturn in its fortunes. The Node 2i is now simply the best performing product of its type available for less than half a grand. When we named Bluesound’s second generation our multi-room Product of the Year in 2015 ­– a title its predecessor had achieved the previous year – the Node 2 was an integral component. Given the lengthy period of time since, however, it was of little surprise that other manufacturers not only caught up, but surpassed the Node 2’s performance. The arrival of Arcam’s rPlay streamer last year was a hefty spanner in the works, offering improved sound in a similarly compact unit at a substantially discounted cost. Consequently, the Node 2 dropped from five stars to three. With just a cursory glance at the Node 2i’s spec sheet, nothing much appears to have changed between the models to dictate so dramatic an upturn in this generation’s sonic performance. However, Bluesound has worked on improving its wireless streamer, and not just in the places you may expect. Between these two multi-room generations, the company had created the NAD Masters M50.2 BluOS network streamer, and the Node 2i’s upgrades begin with trickle-down high-end circuit design and architecture. The layout was then of course optimised to accommodate its new chassis, and further isolation put in between audio and wi-fi frequencies. The new, smaller wi-fi chipset has granted Bluesound the freedom to play with the circuit layout – though the company has admitted to being surprised by how much this has affected the Node 2i’s audio performance. Bluesound has also added some bonus features to its streamer, including that dual-band wi-fi and two-way Bluetooth, as well as a faster processor for an all-round more intuitive user experience. The 32-bit/192kHz DAC remains, as does its long list of connections, including RCA, coaxial, optical and subwoofer outputs, with physical inputs for optical, analogue and USB-A alongside wi-fi, Bluetooth aptX 4.1 and AirPlay 2. Of course, given the added features on its physical products, Bluesound has also had to update its app to a 3.0 version. Thankfully, these changes are limited to accommodating those new technologies, rather than tampering with an already intuitive piece of software. It still lacks features such as being able to connect to Spotify within the app or the inclusion of a universal search function, which gives Sonos an edge in this area, but there can be few complaints otherwise of a controller that makes everything simple and stress-free, from set-up to day-to-day usage and integration. In fact, there is probably cleaner, more pronounced detail across the frequency range emitting from this new model, the Pulse 2i making use of its newly installed tweeters for a presentation that is in line with Bluesound’s characteristic body and warmth without dialling out any of the treble. Other wireless speakers offering comparative power, if not quite the Pulse 2i’s scale, might stray into being over zealous or harsh, but this unit remains in charge of its might, breeding authority over outright brutishness. But while the muscle is lean in many areas, there is an overall more sluggish and less expressive nature to this revised version. The Pulse 2i now struggles to organise instrumental strands as its predecessor did, nor does it inject them with the same life that retained its five stars when all else in the range dropped theirs. This is evident not only when comparing with rival speakers – though the extra £100 on its price tag makes the Pulse 2i’s task more difficult – but even with those products across the rest of the Bluesound range. The Pulse 2i does well to retain the company’s rich tones and levels of insight, but feels a little out of place in the family when it comes to timing and dynamics – two areas in which it had previously done well. But Bluesound’s light touch when it comes to re-engineering the Pulse Flex 2i appears to have paid dividends. It retains the character from its previous incarnation, meaning we get treated to that same confident, full-bodied presentation, only now more detailed and spacious. We’ve long been impressed with how big the Pulse Flex 2i can sound, but a little added sophistication has only served to heighten that impression. This new generation also feels freer to reach into treble frequencies and deal them with the same even hand as it does the rest of its output, while the considerable weight afforded to the bass remains taut and pleasingly agile. As before, the scale of those low frequencies helps the Pulse Flex 2i support the midrange, delivering vocal tracks with a richness other speakers of this size cannot match. But voices aren’t thrown forward unnaturally – Bluesound’s hold on organisation remains across most of the new range – and the melodies are sensibly allowed to lead a track. The gains in sonic performance between the last generation and this, while not particularly dramatic, are undeniably effective. The Pulse Flex’s £299 price tag left it with ground to make up on emerging competitors, and the 2i version still falls just short of the demand, but it has probably become our favourite of the Bluesound speakers. But our favourite Bluesound product (not all are speakers, remember) is undeniably the Node 2i. Wiring it into our reference system, it is clear that this is a different animal altogether to its predecessor. While its richness across the frequencies is retained, the soundstage appears more open, with even more granular detail fed in. Even in such heady surroundings, it feels far from out of place, our reference system merely offering the Node 2i canvas to display its ability. What’s most striking is the improvement in this streamer’s organisation, timing and dynamic expression. These facets were bettered by the Arcam rPlay last time out, but Bluesound has not only cleared the confusion within the Node 2i’s presentation, but also made musicality one of its most alluring fortes. It is in the subtleties of a composition that the Node 2i really thrives, showing an ability to pick out the varying intensities of a fingerpicked guitar, arpeggiated piano line or call-and-answer arrangement that may provide rhythm as much as hold a melody. There is greater life to the performance as well; the Node 2i shows not only an increased level of expression but also enthusiasm. Its considerable bass weight, while always supporting an equally full-bodied midrange, is commissioned now to add kick and drive forward proceedings. As far as sub-£500 wireless streamers go, you’d be hard pushed to find a sound quality superior to that of the Node 2i. Those improvements, along with a family of mostly talented products, has kept Bluesound as an attractive high-end multi-room proposition. For a product of this type, the speakers ultimately carry most of the weight when it comes to performance. The fact that we would award neither of the two Pulse speakers five stars means that overall, it cannot really be a five-star system. But there are certainly class leaders within this family, just as with previous generations. If you pick the right components, a fine multi-room system is within reach.